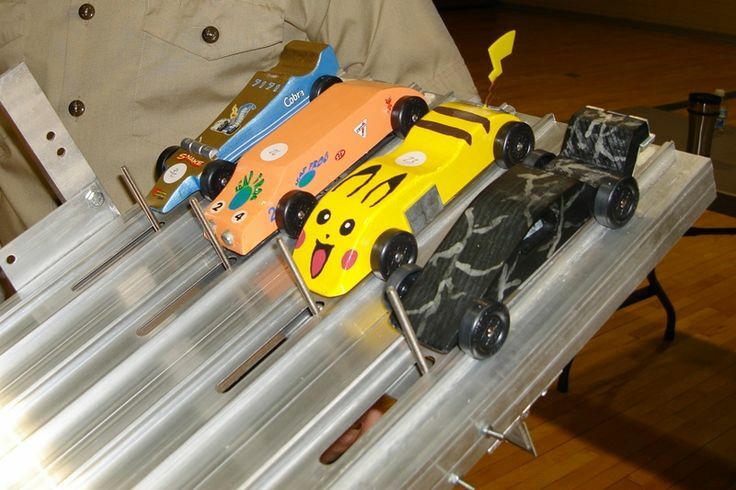 The Pinewood Derby is scheduled for January 27th at 9am and there’s probably some excited scouts (and parents) looking to get started on designing and building their cars. TECH NIGHT– Friday, January 26th 7:00 pm St. Catherine’s gym/all purpose room: This will not be a regular pack meeting. All scouts and additional racers must bring their cars to be weighed and measured on the Pack Scales. Bring your car in a shoe box or Tupperware with your name on it. Once the car conforms, it will be logged in and impounded until the time of the race. Please note, it is very important that you do not use any liquid lube, as it will damage the track, and is against our derby rules! PINEWOOD DERBY RACE DAY – Saturday, January 27th at 9:00 am in the St. Catherine’s gym/all purpose room. The race event usually lasts about 2.5 hours. There will be light snacks and drinks. Craig from RACEMASTERS returns this year to run and announce the races!!! The entire race is run on Race Masters computerized aluminum track. The results return directly to his laptop and he announces the winners of each race on his sound system. The computer calculates the speed of each car in scale mph. One of the fastest Pack 96 speeds is around 208 mph! The numbers have been programmed into their computer software along with the scout’s name, so please only use the number assigned to you. PARENT/SIBLING RACE: As in years past, anyone that would like to build and race a Pinewood Derby car can also do so, and you will be entered into a separate race. Respond to this email if you will be participating as a non-scout entry so we can have your info prior to the event. Please do not assign your own car number as we do not want the chance of duplicates, and it would make the volunteers setting up the races job very difficult. Once I know you are entering into the race, I will assign your car number and provide it to you. Every scout will receive a Pinewood Derby patch for participating to display on their red patch vest! Once all the races are over and awards given, you will be able to pick up your car from the pit crew. Height of no more than 2 3/4″ is very important as it is the maximum limitation of the height for the track timer. It works on a series of light emitting diodes, and they perform best when kept within this limit. The block may be shaped any way that is desired. The car must be freewheeling, with no starting devices. The car must not ride on any type of springs. Wheel bearings, washers or bushings are prohibited. The axles supplied with the kit must be used. They may be polished or lubricated with graphite only. No liquid lubricants can be used. They tend to leak out of the axles and make the track slick. This can cause unexpected results for cars that follow. The wheels supplied with the kit must be used. The wheels may not be cut, drilled, beveled or rounded. You may remove the seam from the wheels. We will have some tools on hand to make any last minute modifications to the vehicles, if needed, to make specs. NOTES TO PARENTS: WE NEED YOUR HELP! This is typically a busy night. I will be manning the check in table and with 50+ cars to check in and possibly modify, help will be needed, so anyone that can come please do! Also, please discuss a few rules with your children before the Pinewood Derby, and make sure your children obey them. Keep all food and drinks behind the race barriers. If the track gets wet, or food on it, it could be damaged and the race may not be able to continue. No scout or sibling is permitted to leave the race area without an adult. Any scout or sibling that is disobeying the rules will be brought directly to the parent, there will be no warnings given. The parent will then be able to keep tabs on how many time the scout or sibling was spoken to by another Akela. If your child has been brought to you three times, we ask that you not release them but that they stay with you for the remainder of the event. This is for their safety and the safety of others.